We take a look at five of the leading 2019 Grand National jockeys that are set to ride some of the well-fancied runners. We’ll also highlight the main jockey performances for the 2018/19 season as we draw ever nearer to the race. 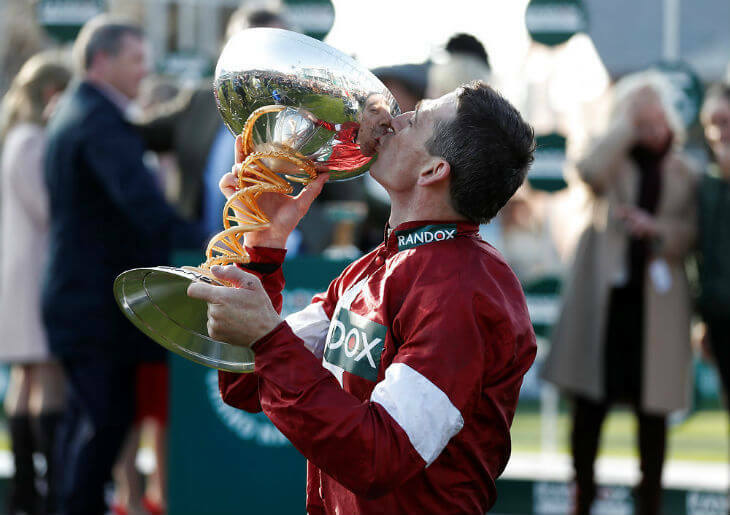 Aged 39, Davy Russell is another of the older statesman in the jumps jockeys weighing room. Based in Ireland, Russell have ridden many big winners over the years – mainly for the powerful Gigginstown Stud House owners. He was also one of the older jockeys that this race was eluding – until last year (2018). Russell finally got a Grand National win on his CV after steering home the Gordon Elliott-trained Tiger Roll to victory in the 2018 running. At 38 that year, Russell was the oldest jockey in the race – it was his 14th ride in the Grand National. After spending ages trying to win the race, Russell added to his Grand National tally straight away as he steered home Tiger Roll in the 2019 Grand National too. Those two quick wins have catapulted Russell as a household name with racing fans over the world and there is every chance he can win the race for a third consecutive year – as far as we can see, no jockey has won the Grand National three times in a row. Top Irish jockey, Ruby Walsh, hasn’t won the Grand National for 14 years. But with two successes, he’s still one of the most successful Grand National jockeys in the race that’s still riding. The first of his Grand National wins was an emotional one as it came riding Papillon (2000) for his father – Ted Walsh. The horse was well-backed that day into 10/1 and didn’t let punters down to win by 1 ¾ at the line. Ruby Walsh had to wait just five years for his second National winner. He steered Hedgehunter to victory in 2005 for trainer, and long-time boss, Willie Mullins, plus it gave popular owner – Trevor Hemmings – his first of three victories in the race. Being one of the most experienced jumps jockeys still riding then Ruby Walsh-ridden horses are always popular in the Grand National betting market. Backed-up in 2017 with his mount – Pleasant Company (9th) – supported into 11/1 third favourite. With Walsh having been injured for much of the 2017-18 season, the jockey nicknamed ‘the Silver Fox’ missed the 2018 running of the Grand National but is now back riding and with an injury-free campaign will have his sights set on a third win in the race. He’s likely to get the pick from the Willie Mullins runners and in 2019 once again teamed-up with Mullins to finish third on Rathvinden. Top UK-based jockey – Richard Johnson – is yet to land the Grand National. So, with time running out on his long career he’ll be keen to do what his pal AP McCoy did and land the big race before he retires. There has been no talk of Johnson retiring from the saddle just yet, but at 40 years old he can’t have many Nationals left. Having been runner-up as champion jockey 16 times, he was finally crowned champion jockey in 2016, 2017 and 2018 His Grand National record so far reads as follows – UR, F, F, PU, F, 2nd, 10th, BD, PU, PU, R, F, F, 9th, PU, 12th, 15th, 2nd, F, PU. Therefore, from 20 rides in the race, he’s actually failed to complete in 14! Two seconds in 2004 (What’s Up Boys) and 2014 (Balthazar King) have seen him go close. There is probably no other Grand National jockeys still riding that deserves to win the Grand National more. At this stage, it’s hard to know what he’ll ride and it’s hard to believe he didn’t have a ride in the 2018 running. In 2019, Johnson rode the Philip Hobbs-trained Rock The Kasbah, but was brought-down at the 18th fence. At 42, Leighton Aspell is one of the older statesmen in the jump weighing room. But with two recent Grand National wins under his belt, when he does hang-up his riding boots – he’ll retire a happy man. Pineau De Re (2014) was the first of those victories as he steered home the Dr Richard Newland-trained 11-year-old in 2014. While he became the first jockey since Brian Fletcher on Red Rum in 1973 & 1974 to win back-to-back Grand Nationals in 2015 when he won on Many Clouds the following year. That winner gave popular owner – Trevor Hemmings – his third win in the race too as he also owned the 2005 & 2011 winners Hedgehunter & Ballabriggs. Aspell completed again in 2017 when riding the former Gold Cup winner – Lord Windermere – to be seventh in the race. He also rode Many Clouds to be 16th in the 2016 running. So, having completed in four of the last five Nationals he’s sure to be in popular demand when the trainers start to look for Grand National jockeys to ride their horses. He’s another that missed the 2018 running of the race due to injury but is back riding and barring any incidents will have his sights set on another win in this famous race. His experience and winning form in the race are sure to attract many trainers, but he mainly rides for the Oliver Sherwood camp. Aged 39, Barry Geraghty is another of the older Grand National jockeys still riding that will be popular for punters. His record in the race reads 6th, F, UR, 1st, 4th, 16th, 6th, 3rd, 4th, F, 4th, F, 9TH, UR, PU, 9th, PU, 4th. So, he has completed in 11 of his 18 starts to date, plus ridden one winner – Monty’s Pass (2003). He’s ridden three times without success in the race for trainer Nicky Henderson in recent years, but in 2018 steered the 8-year-old Anibale Fly to a fine fourth in the race. Being the number one jockey for popular Irish owner JP McManus, Geragthy will have plenty of options ahead of the race. McManus won the Grand National for the only time in 2010 with Don’t Push It but is sure to fire a few arrows at the race again in 2019. At this stage, last year’s fourth – Anibale Fly – could easily return for another tilt at the race and with another year on his back and the experience of the fences then he looks sure to be a big player again if having a trouble-free season. Grand National Ante post betting tips.